As the only place in Cornwall officially classed as a city, Truro is a destination many visitors to Cornwall see during their time there, either as a place where they need to change transport connections if travelling down by coach or train, or as somewhere to go to look for a good variety of shops and other amenities not really found in many small Cornish towns popular with holidaymakers, such as cinemas. Truro is a small but attractive city that has plenty to keep visitors entertained, and can make for a good place for a weekend break in its own right. Like most places in Cornwall, the only truly easy way to get to Truro from outside of the county is to drive. There is a direct train line between Truro and London Paddington, which goes through other cities like Reading, Plymouth and Exeter, but unless you are coming from one of these places you will need to make changes to get here by public transport. A coach is another option, with coaches to Truro departing from London Victoria. If you are looking to visit Truro from elsewhere in Cornwall, there are local buses to plenty of other places like St Austell, Penzance, Falmouth, Cambourne and Newquay, and a small local branch line that runs to Truro from stations between here and Falmouth. There are also taxi companies within the city. 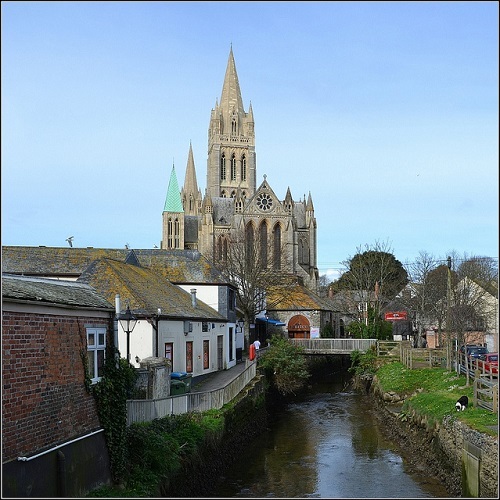 One of Truro’s most famous sights is its cathedral, which can be seen from most places in the city thanks to its tall green spires. The cathedral was only completed in 1910, though some parts are far older. It is possible to look around the cathedral for free during the day when there isn’t a service going on, and it also has its own cafe and gift shop. The Lemon Quay area of Truro was refurbished in the last decade to create a pedestrianised piazza where there are sometimes events during the summer, and there are also outside areas to eat and drink in the style of European pavement cafes. This can be a pleasant place to relax and socialise on a sunny afternoon. If you are looking for entertainment, Truro is home to the Hall for Cornwall, which often features plays, musical performances and other performing arts like stand up comedy. It also sometimes houses a large market during the day where you can find some really interesting antiques and vintage items. Truro has some very good restaurants, and as you might expect in Cornwall, a lot of these centre around fish and seafood. If you enjoy this kind of food, you will be spoilt for choice at all ends of the budget spectrum when looking to eat out in the city centre. Truro also has a good nightlife, with plenty of lively pubs and bars and a couple of popular night clubs. Truro is a charming place that gives you the sense of having all the amenities of a proper city while still being in a quaint, attractive town. It is well worth a visit during any stay in Cornwall.